Backed by our highly skilled and experienced professionals we are offering our clients with a wide range of Dust Suppression System. Our offered product is use to suppresses dust from a typical source by preventing it from becoming air borne and by returning it to the main material. Fog Dust Suppression Fog Cannon System designed by cloud tech is extremely efficient in handling the problem of airborne dust particles. These suppress the dust particles through fogging and are available in various models. Finding usage at several places including mining sites, demolition sites and bulk material handling spaces, these are regarded for their automatic rotation and adjustable elevation angle. Fog Cannon Dust Suppression System designed by cloud tech is extremely efficient in handling the problem of airborne dust particles. These suppress the dust particles through fogging and are available in various models. Finding usage at several places including mining sites, demolition sites and bulk material handling spaces, these are regarded as their automatic rotation and adjustable elevation angle. 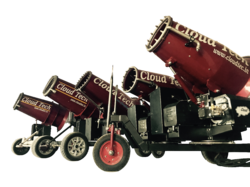 Cloud tech, with its superb experience, offers Industrial Dust Suppression Systems which are extremely capable of capturing dust particles and have advanced features installed in them. Efficient in their performance, these are widely acclaimed and appreciated by the customers. We offer these Systems at competitive prices. These systems involve low maintenance costs also. 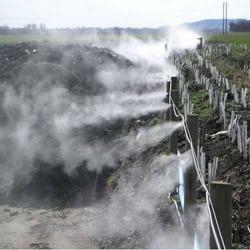 Being engaged in the specified business, we have introduced Cold Fog Dust Suppression System. This is user-friendly and offers optimum performance in the suppression of dust particles. Having advanced features, these are delivered in various models and are our valued offerings. We have fabricated and tested these systems as per the international market requisites and ensure our clients best capital value in return. 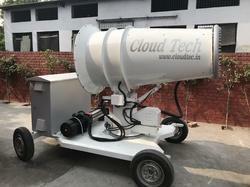 The Cloud Tech Fog Cannon has been designed to tackle the problem of airborne dust particles generated by open mining activities, general demolition work and bulk material handling Fog Cannon has been shown to suppress up to 95% of airborne dust particles. The smaller units are ideal for suppressing dust where it is generated in high concentrations at easily defined point sources such as discharging onto stockpiles, discharging into ships, reclaiming from stockpiles, dumping, crushing and loading/unloading trucks. In this case the Fog Cannon is directed at the point source of dust and it rapidly suppresses the emitted dust before it can disperse. The larger units are where Fog Cannon are unique, as they are able to suppress general airborne open area dust through fogging the general area. The larger units are also capable of suppressing dust caused by high volume dust events such as blasting - and the long throw distance is usually necessary for this. Fog Cannons are also useful for dust suppression of stockpiles where their low water use is an advantage. Original Manufacturer of Fog Cannon Dust Suppression System in India. 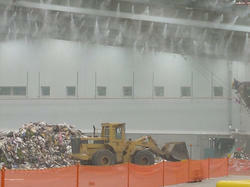 Looking for Dust Suppression System ?